During my two and a half year tenure in a big glass box in Victoria, you would often find me grumbling about the food options. Limited to a stroll around M&S or notching your way towards that elusive free whole chicken at Nandos, you could say I was looking for a bit more. In my search for a decent feed, I have been to Kazan, Giraffe and Cyprus Mangal, all decent eateries in their own right but not really ideal for a quick light lunch. I let out a long sigh and resigned myself to my regular trips to M&S where I would always spend way too much on stuff I didn't really need. Enter Pimlico Fresh, stage right. A mere couple of months after I left the big glass box, never to return, what do I stumble upon but exactly what I was previously looking for. 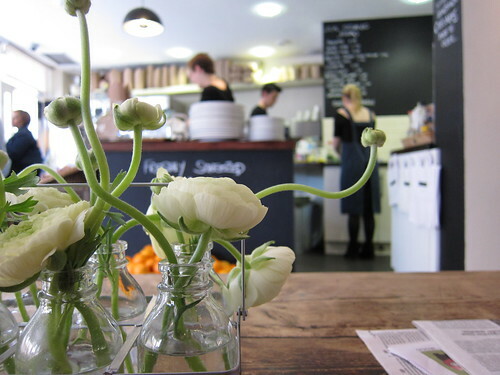 Located on Wilton Road, a mere stroll from the aforementioned big glass box, Pimlico Fresh is a new(ish) cafe selling good quality fresh food, all simply prepared, letting the ingredients speak for themselves. 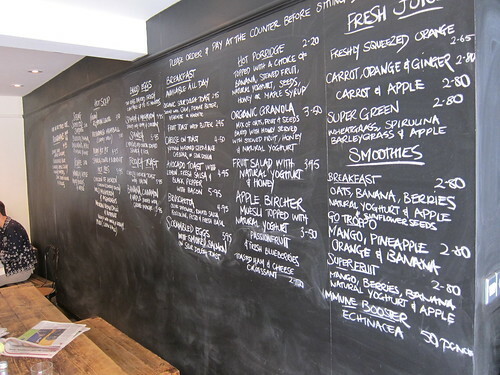 I walked in and was directed to choose from the menu scrawled (well, written in rather neat handwriting) along the entirety of one of the walls. I plumped for a coffee (flat white naturallement) and an avocado toast with extra bacon. I sat down and started to read snippets from the newspapers strewn across the tables and a short while later, food arrived. 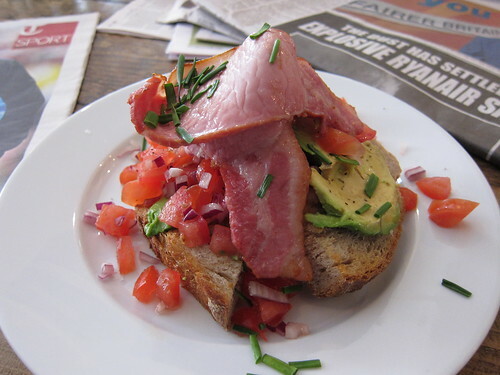 What I got was slices of avocado and tomato salsa on a toasted sourdough base, with a few rashers of delicious bacon thrown on top for good measure. Simple food, but delicious and affordable. So Pimlico Fresh, a mecca away from the grease merchants and various fast food establishments that seem to have infested Victoria and the surrounding areas. I really wish this had been open during my tenure in the big glass box. There is so much that makes me happy about it. It is uncomplicated, but simple and decent grub. The staff are casual but attentive and the communal tables force the more unsociable amongst us to smile at strangers where we previously may not have. Still not enough to make me move back to Victoria, but a nice distraction when I am in the area. I hate how that happens - always the way! When are your Melbourne posts coming - interested to hear what you thought? Ah! Have you tried Gastronomica on Tachbrook Street (www.gastronomica.co.uk)? It is a bit hidden out of sight of Warwick Way. I live locally in Westminster and this is my fav Italian deli/caffe/restaurant. Sounds great, and a welcome addition to the ever-increasing 'foodie village' which Wilton Road has become. Not too far from home so I'll pop in! @GC- Have been slack but will crack onto it very soon! @Louise W - Ha, yes. It is pretty good and authentic but mainly sandwiches. Nowhere really to eat lunch unless you take it back to your desk. @sunfug - Thanks, will check it out at some stage! @HW - Definitely check it out. There are actually a few decent ones, just wish I had discovered this whilst I was working. @Helen - The avocado toast is £5 with an extra quid for the bacon. Not massively cheap but good value for the area for a filling and decent lunch. Looks lovely - but a frustrating time to make the discovering! I cant find the place? is it opposite Sainsbury's market? I ended up getting some wings there!